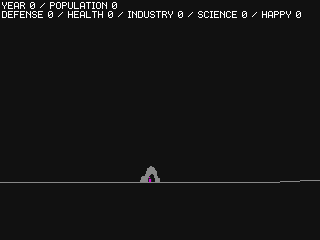 This jam's theme was A Small World, and the game I made is called 38th Century. 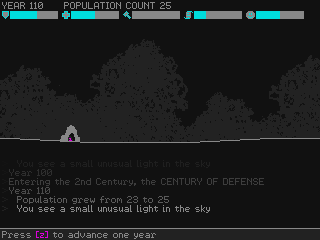 It's a simple world simulation game where you guide a civilization through the ages. Even though I took 72h to make it, I followed the 48h Compo rules and everything was made from scratch. 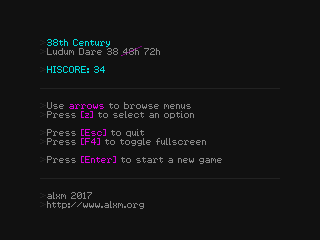 Ludum Dare is perfect for distilling complex games into a few simple features that approximate the original. 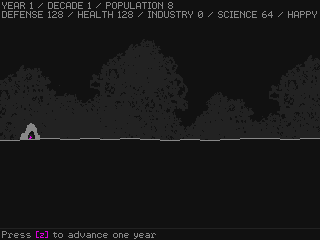 I thought it would be cool to make a super bare-bones world simulator where you observe events every decade, then steer the civilization's progress at the beginning of each century via a short menu of options. 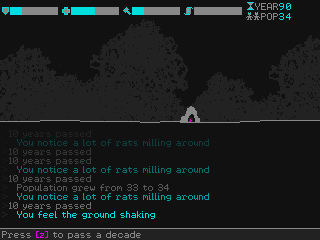 Unlike at past jams, I designed the whole game before I started on the graphics and code. This ate up the first 24h, which is part of why I took the full 72h instead of 48. I didn't have time to implement everything I planned, but knowing exactly what I wanted to accomplish throughout the coding phase was a good motivator. 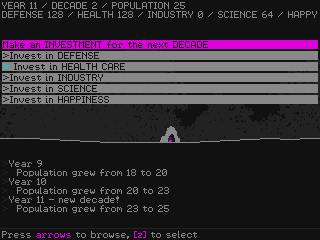 There are four development areas: defense, health, industry, and science. 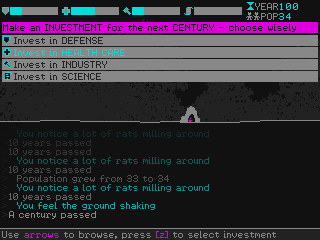 For example, if you notice lots of rats as decades pass then you should invest in health care, so that you have enough health points when the century is up and the plague hits - otherwise, people start to die. Other development areas similarly protect against different disasters like earthquakes and alien attacks. 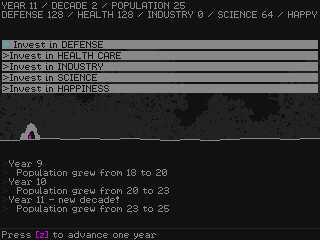 When the science development is maxed out, the civilization evolves to its next stage. 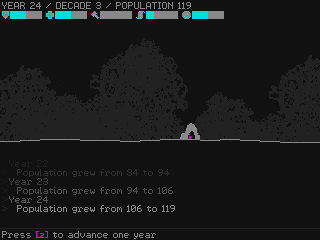 I didn't have time to implement this part for Ludum Dare though, so evolutions are only used as score multipliers. This was fun as always, but otherwise uneventful. After the lessons learned from the last couple of jams, my engine was ready to go with everything I needed. 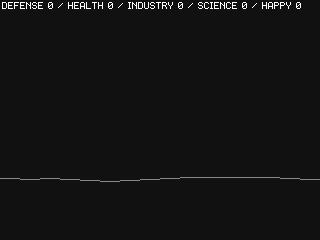 I tried to go with the simplest solution for everything and not over-think what is ultimately a weekend prototype. 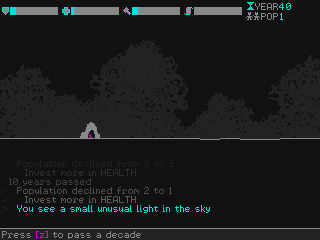 I even reused some code from my last game jam, which saved a bit of time. 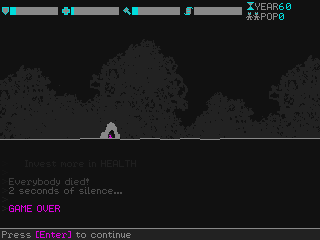 While these are all missing, I did manage to release a simple but complete game with a title screen, bare-bones content, and hiscores. This is something I had trouble with in the past, where not only would I have to cut features to make the few-days deadline, but I'd also run out of time to tie everything together into an actual game.